Last Call: Why is gender reveal lasagna a thing? Our own Salty Waitress just answered a question from a reader who was planning to propose to his girlfriend at a restaurant. This brought up comments from many other Takeout readers who felt strongly about keeping such private relationship moments private, and not making a public spectacle out of every single life change. Gender reveal parties just sound like a bad deal to me regardless, even when they don’t involve setting off major wildfires. But blue or pink frosted cupcakes now seem tame when compared to this new gender reveal menu item supplied by national Italian chain Villa Italian Kitchen. 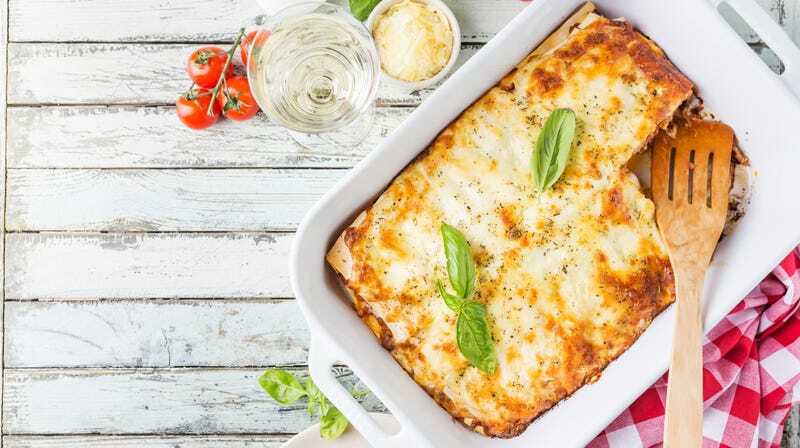 The cheese inside a lasagna is dyed blue or pink, so the gender is revealed by cutting into it. Then I guess everyone feasts on the unappetizing pink or blue pasta dish.